I've a bit of an interesting tease for you all this afternoon. Earlier today, I received word directly from Bandai regarding a very special opportunity for Mega Man fans coming down the pike that's, well, pretty awesome. I can't really dig into specifics at the moment, but I will say that you may want to keep close watch on Bluefin Tamashii's official Facebook page. There, an announcement will be made in the near future that will involve the participation of U.S fans. You will be presented with a tantalizing task that will directly influence something Mega Man related coming from the fine folks at Bandai. New D-Arts, perhaps? I can't say. So, yeah, chew on that for a while. In the meantime, I suggest you scope out Bluefin Tamashii's Twitter. There's a couple clues lurking around there that will help you get a better idea of the forthcoming task. They're not too hard to find, especially if you're well versed in the traditions of Bandai's past cooperative efforts with certain fan bases. It's figure related, I think. The post references Bluefin -- a subsidiary of Bandia toys. I hope it's something like pick a new figure or something! Hopefully we get to help decide which figure they create next. Since I am pretty sure we bought more of the figures than Japan. Because no matter what COJ thinks, Mega Man has a bigger fan base in America. 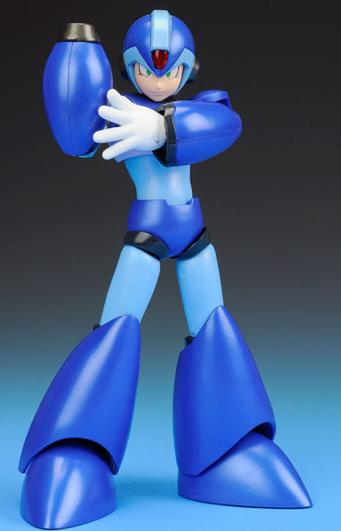 New line of Mega Man figures. Series 4: Dr. Cossack, Kalinka with Eddie, MM 4 boss masters. Too idealistic, I know. But I guess to some it's insane to ask fans to design products for fans. AND HOPEFULLY NOT AS AN EXCLUSIVE. That would be cool if it was a Tamashii Nations Exclusive USA thing like they did with Vegeta and SS3 Goku, and Future Trunks. I want my X2, and X3 Armors, X4 and Falcon and Gaea armors please! aaaaarrrghhh! not another toy please... im gonna be poor...! god im still preordering the tamashii nation comic version, marty garage kit, and prairie... god... give me strength and money! I personally would like Red Joker and Black Ace as figures. They'd look fantastic. GIVE ME VILE AND HARP NOTE. Funny, on the note of the D Arts figures and that specific picture of regular X....has anybody else found it hard to find regular X for a decent price recently? I keep finding the damn manga version or metallic NYC one but not the regular version for like...even under $80. It's ridiculous. A D-Arts Axl figure to round off the set? Maybe? Please? Its funny to see how some of these people think its gonna be from NT Warrior, Starforce, or even Axl. LOL!!! Though, Kotobukiya jumped into the Zero series skipping others. You don't know how Bandai works, do you? yes even here in philippines the regular D-Arts X is much more pricey than Zero and Full Armor... i dont get it either XD but still got both lol the SDCC ver. I honestly hope they make a d-arts version of the x2 and x3 armors as well as a x4 ultimate armor. also some more bad guys would be nice like a vile mk II figure from x3 or bit and byte figures from x3. also it would be cool as hell if they made a ride armor and maybe a line of d-arts original megaman figures with the megaman 7-8 art style. but in all honestly i'd like to see some more x-series figures the most. either way, whatever bandai decides to do they usually make a high quality product so its guaranteed to be awesome. anything from Ryuusei please lol. oh and yess especially Red Joker and Black Ace!! they would be epic figures.